Skunk Factory is a bold, ambitious, and up-and-coming Bay-area brand. Its mission is to provide a line of handcrafted, all-natural products tailored to a specific demographic of cannabis consumers: those who live life unapologetically and place value on diversity and inclusion. According to data from Statista, the average age of cannabis consumers is 37. However, Skunk Factory’s vision is to appeal to women and men aged 25-35, and those over 35 who identify with a younger lifestyle. 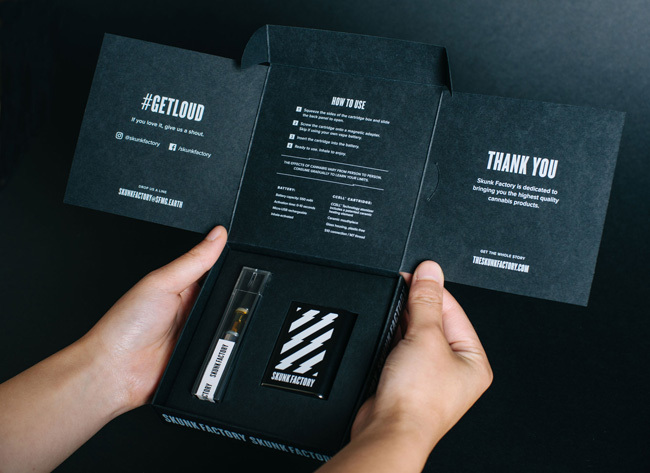 The company brought in Noise 13 to develop the branding and packaging for the 2018 launch of its handheld vape kit and cartridges. 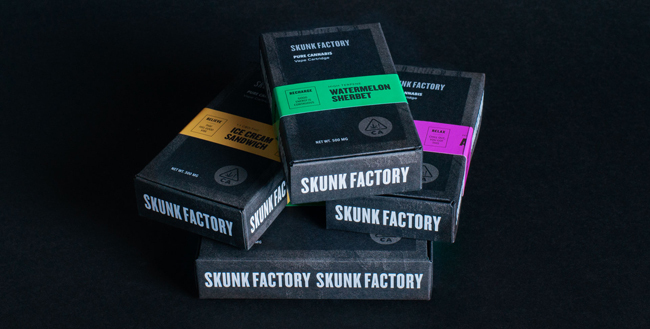 Dava Guthmiller, Founder/Chief Creative of Noise 13 said the initial branding inspiration came from Skunk Factory’s already established street-savvy aesthetic, one that its target audience closely identifies with. 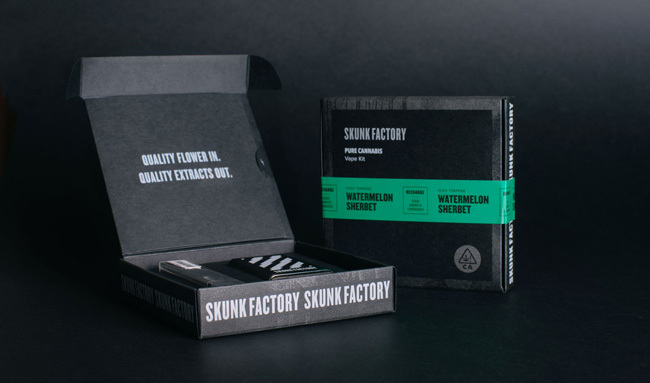 One of Skunk Factory’s primary criteria was to develop an elevated, high-end package that conveyed the quality of the product inside while aligning with its brand aesthetic. Elaine Chaw and the Noise 13 team designed a sleek, uncoated black box with white and metallic silver inks, and a bold pop of color. 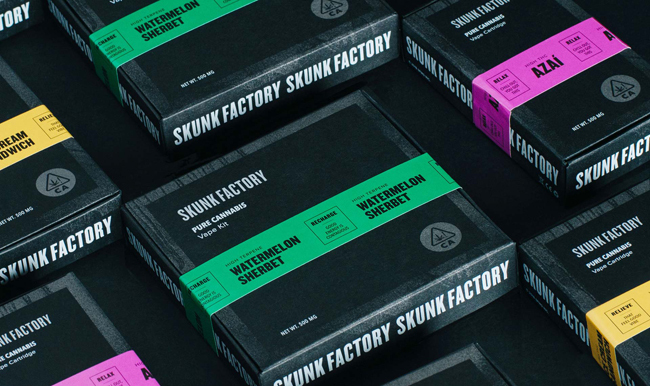 Skunk Factory kicked off its line with three flavors — Azaî, Watermelon Sherbet, and Ice Cream Sandwich — another strategy designed to appeal to its younger demographic. 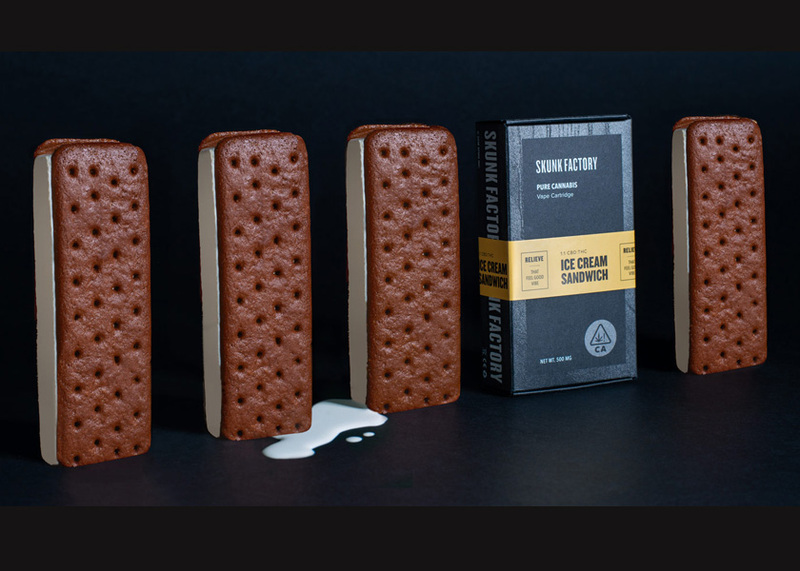 The flavor indicators are inspired by caution tape, with a repeat pattern designed to represent street signs and street wear. Incorporating these pops of bright color punches up the look and adds a layer of attention-getting appeal. This well-designed minimalistic approach speaks directly to the personality traits of the brand: Edgy, confident, and culture-forward. Guthmiller said partnering with CA Litho on the production helped them overcome some production challenges, like getting the silver spray paint texture to read clearly on an uncoated paper. “We decide to actually spray paint white and black sheets of paper with silver and black paint to see what worked best. 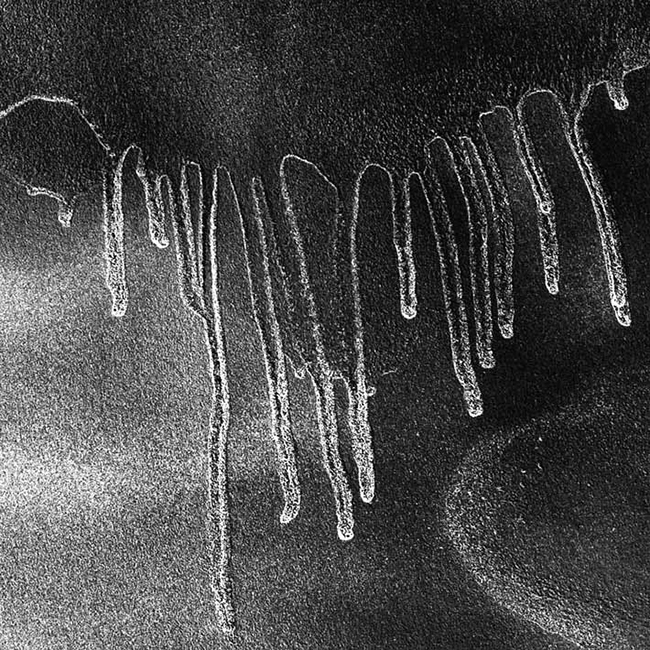 We ended up scanning in black paint on white paper, then printing with metallic silver ink,” she said.